Good news should be newsworthy. However, the last 11 years post the Women’s Health Initiative (WHI) has been a constant stream of negative news about menopausal hormone therapy (MHT) and apparently, bad news sells. However, misinformation kills. Further studies, including the KEEPS trial and DOPS (previously reviewed in my blog post, the “Anti-Hormone Party is Over”) continued with very positive news for postmenopausal women who need hormone therapy and for those women who may be hormonally deficient and needing replacement therapy for preventive effects as well as treatment effects. Nearly, every day in my practice, I see a woman who needs MHT, but is petrified to take prescribed therapy because of the very imbalanced and biased information that has been promulgated, not only by the media but by medical organizations that have been unduly influenced by the WHI and the WHI investigators. Have You Heard the Latest WHI News? Last week, a mathematical study was published making the very point that up to 90,000 American women with hysterectomies may have died prematurely because of avoiding estrogen therapy! That’s a big number. So yes, misinformation, fear mongering, exaggerating the risks of MHT and downplaying the benefits has led to a reduced quality of life for many symptomatic menopausal women who have foregone or forsaken therapy - or not even been offered therapy by their equally, misinformed healthcare providers. It has also potentially cost women their lives in terms of translating to more fractures, higher death rates and consequently a shorter lifespan. Untold misery for symptomatic women and their families has needlessly occurred. That fact, I am absolutely certain of. Fortunately, there are non-hormonal options available for women who cannot or will not use MHT. Some medical outlets did run the story. You can watch the interview on the Landmark study: Esotrogen saves lives post hysterectomy with author @DrDavidKatz and myself, Dr. Thacker. In professional circles, there has been varying opinions, with the majority of those opinions associated with the (in)famous WHI study. And unfortunately, they are clinging to their negative narrative which is simply not true. Unfortunately, the MHT controversy continues in 2013. Read the NAMS First to Know commentaries, especially Dr. Howard Hodis's clarifying commentary. Last year, on the 10th anniversary of the WHI, the most respected menopause expert in the world, Dr. Wulf Utian, called for an independent inquiry into the WHI. This past weekend he wrote a superb blog comparing the damage done to women on par with the horrible loss of life in recent US wars in Iraq and Afghanistan. 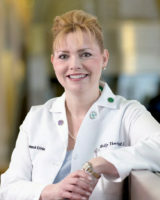 Our @SPKwomenshealth tweet was “Kudos to Dr. @WulfUtian A must read for women and for all those that care about women! http://bit.ly/12sa3SN."